It’s the height of summer and a lot of people are out every weekend enjoying themselves. Tokyo is a buzzing place with people leaving the city on the weekends to go to the various beaches that are around Tokyo. There are also a lot of festivals that happen during the summer as well as fireworks. Two years ago I wrote about the fireworks in Japan and in the past two years, nothing has really changed. In Tokyo, there are really only three festivals that really need to be mentioned. The rest of the festivals in the surrounding areas are great and wonderful to go to but they pale in comparison to the popularity of these four festivals. The first festival is the Sumidagawa Hanabi Taikai, also known as the Sumida River Fireworks Festival. It is one of the biggest festivals with about 20,000 fireworks set ablaze from two different locations. One of them is located close to Asakusa Station and the other towards the south of Asakusa Station. These are huge displays that have people inviting all of their friends to their homes to have parties. Last year, 2011, the Sumidagawa Fireworks was the only fireworks festival in Tokyo due to the huge earthquake in March of that year. This year all of the festivals have returned and the Sumidagawa festival was back to its original splendor. 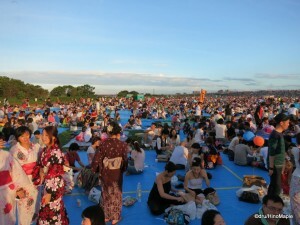 Last year, the location I went to watch the fireworks show was not terribly busy. 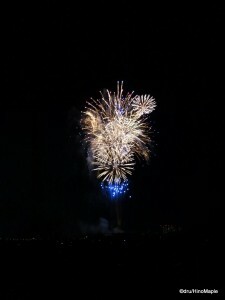 It was nice to go and have an area with a good view of the fireworks without much trouble. This year was a little different. It was noticeably bigger and a lot of people in the surrounding apartment buildings had their own parties. It was a raucous event this year with people screaming words of joy. I remember hearing words such as “Never stop!! !” or even the utterly strange “Orange Juice!!! !” It is probably just a Shitamachi thing that people will shout strange words at the top of their lungs to express their joy. It also has something to do with the fact that a lot of people were drunk. Being drunk is nearly a prerequisite for having these parties. Finding a good place to watch the Sumidagawa Fireworks is a feat in itself and should be taken with caution if you are visiting. Avoiding the busiest areas along the river is best, however finding a smaller park with somewhat obstructed views is better if you want to keep your sanity. 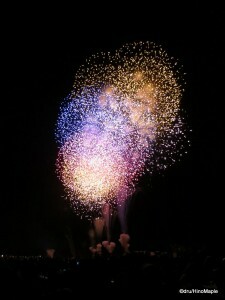 Two years ago I went to the Edogawa-ku Hanabi Taikai, or Edogawa Fireworks Festival. This festival has a paltry 14,000 fireworks on display compared to the Sumidagawa Fireworks. The Edogawa Fireworks is located on the Edogawa River between Koiwa Station and Shinozaki Station on the border between Tokyo and Chiba. It is a great place because it is in the middle of a residential area and in the middle of a huge park. The entire river is lined by a huge park with large banks on the side. My friend John held the same party two years ago when I went and wrote about it. This year would see roughly 200 people attending the event. The Edogawa Fireworks is an ordeal to prepare. There are portable toilets that are brought in as well as a temporary police station set up to keep people safe. There are a lot of signs that are brought in so that people know where to meet their friends, or at least try to meet them. Since it was the second time for me to go, I knew exactly where to go and my friend John is such a pro that he even made a video to help people find their way. The party actually started the day before at about 5pm when he went out and got a huge area ready for the party. With about 200 people expected to attend, he needed enough space for everyone. He then had to camp out all night, thankfully with a few friends, to make sure no one stole the area. I can’t imagine how tough it was for him, but he seemed to have had a better time of it than he did two years ago. The party doesn’t really start until about 4pm when the stations get super busy. I arrived around 5pm at Koiwa Station where I had to push around the crowds to get to the party location. The station is the worst area as it is crowded with people and many others waiting for friends. Getting to the main site is also a challenge with many people blocking the streets and preventing those who want to go quickly from doing so. Once you do find the area with your friends, you still have to find them. Finding a specific blue sheet out of thousands is pretty tough. If you think that using a phone to find friends is possible, it isn’t. You are with hundreds of thousands of people in a small area so getting reception for your phone is very tricky and contacting a friend in the same area is nearly impossible. Once you do find your friends you can finally relax and just start the craziness. Lots of beer and liquor was enjoyed by everyone and by the time the fireworks did start, I would say most people were pretty tipsy. The fireworks did go off without a hitch and afterwards a lot of people made the mad dash to get home. I decided to stay a while and make sure things were mostly cleaned up on time. I didn’t start my return home till 11pm and thankfully the train was not terribly busy as most of the crowds had left already, but it was definitely busier than any normal day. Fireworks in Japan are very predictable making it easy to figure out when the big fireworks are going to happen. Generally the show starts big. This year at the Edogawa Fireworks there wasn’t a countdown so I was a bit surprised when it did start. You can probably time it easily as long as you just keep an eye on your watch. This is something that is difficult to do when you are drinking and having fun. The next thing to learn is the pattern. Generally the fireworks follow a big burst followed by a quiet period with just one firework being set off at a time. This repeats for the entire time of the fireworks. There is a very simple reason for this and that is smoke. It takes time for the smoke to clear and it would ruin the show if they just did a huge display of fireworks each time. The big blast section tends to last just a minute or so followed by a few minutes of single fireworks to let the smoke clear. Sometimes it is pretty easy to figure out when the big displays will happen because they start to play music. It is easier to tell when you are at one of the big areas for watching the fireworks rather than in your own apartment, but there really isn’t too much you can do when you are in an apartment and far from the loud speakers near the front. This happened to me during the Sumidagawa Fireworks as I just had no idea when the fireworks would be going off. The other problem is that because the Sumidagawa Fireworks are in two locations and I could only clearly see one, I couldn’t easily tell what was going on as they didn’t always have fireworks going off at the location I could see. Either way the displays were beautiful and they are growing on me year after year. 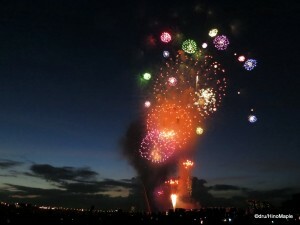 The last major festival in Tokyo this year is the Tokyo Bay Fireworks. This is not the biggest and it is now rivaled by the Sumidagawa Fireworks for being the most beautiful fireworks festival of the year in Tokyo. The Tokyo Bay Fireworks is set to a backdrop of Rainbow Bridge that used to be one of the most stunning views for the fireworks. Now with Tokyo Sky Tree completed and lit up, this may no longer be the case but as with everything “beauty is in the eye of the beholder.” Unfortunately, I won’t be going to the Tokyo Bay Fireworks this year but I almost had a chance to go while having a party on a boat. This is one of the more popular things to do for these fireworks but it looks like I’ll be as busy as ever. To give you an idea on the various fireworks around Tokyo this year, here are a few statistics to munch on. On average, most of the fireworks start around 7:30pm and last about an hour. The longest fireworks display is the Itabashi Fireworks Festival located on the Arakawa River on the border of Saitama and Tokyo. The earliest fireworks festival is the Sumidagawa Fireworks Festival that runs on the last Saturday of July. The Sumidagawa, Tokyo Bay, and Itabashi Fireworks all start at 7pm making them all the earliest start time. 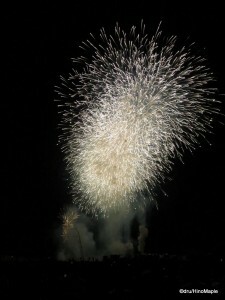 The largest display is the Sumidagawa Fireworks with an estimated 20,000 fireworks set off at that time alone. The longest fireworks display is the Itabashi Fireworks, but it is combined with the Toda Fireworks at the same location to bring it to a total 1.75 hours. The most attended festival is the Edogawa Fireworks with an estimated 1,390,000 people attending this festival alone. In fact, if you combine it with the Itabashi Fireworks, 950,000 people, which happens on the same day, you get an estimated 2,340,000 people watching the fireworks on that single day alone. Note that because some of the people will be sitting in Chiba and Saitama during these festivals, I am simplifying everything by combining it all into one huge number. If we look at just Tokyo alone, the Edogawa is still pretty strong with 900,000 people attending on the Tokyo side, but the Meiji Jingu is the largest with 1,000,000 people estimated with the Sumidagawa coming in second with 948,000 people and Tokyo Bay a distant 700,000. Needless to say, fireworks are very popular in Japan and Tokyo and it will always be popular. This entry was posted in Fireworks, Tokyo and tagged Asakusa, Chiba, Edo River, Edogawa, Edogawa Fireworks, Edogawa Fireworks Fesitval, Edogawa River, Edogawa-ku, Edogawaku Hanabi, Edogawaku Hanabi Taikai, festial, fireworks, fireworks festival, fireworks in Japan, Hanabi, Hanabi Taikai, Itabashi, Itabashi-ku, japan, Japan Fireworks, Jingu, Jingu Fireworks, Koiwa, Rainbow Bridge, Saitama, Shinozaki, Shitamachi, Sumida, Sumida Fireworks, Sumida Fireworks Festival, Sumida Hanabi, Sumida River, Sumida-ku, Sumidagawa, Sumidagawa Fireworks, Sumidagawa Fireworks Festival, Sumidagawa Hanaba Taikai, tokyo, Tokyo Bay, Tokyo Bay Fireworks, Tokyo Bay Hanabi, Tokyo Wan, Tokyo Wan Fireworks by Dru. Bookmark the permalink. But while I love fireworks, not too sure about braving the massive crowd. This the fireworks post to beat all other fireworks posts, the biggest of the big bangs, the grandest of ’em all! Wow. Excellent! 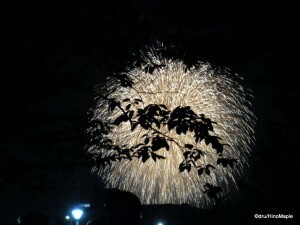 The Edogawa Fireworks is one of the best festivals in Tokyo, IMO, but I’m not brave enough to go every year. I’ll never forget the crush at Koiwa Station and in the train after the event. If I didn’t have a friend who did all the work to reserve a space for the Edogawa fireworks, I wouldn’t go to be honest. Just too much of a hassle. You have one of the best views of the fireworks. Really jealous. I can’t see them. My place is great but no view. Can’t see Sky Tree or the fireworks. I think I need to cultivate better friends! :p One who specializes in fireworks, another one for awa-odori and another one for matsuri.